Lakeview Elementary School teacher Roxanne Simmons, proud mom Rose Han and Rotary Student of the Month Hannah Han celebrate Hannah's success with Lakeview Principal Judy Chance, Rescue Union School District Superintendent David Swart and Rotary CLub of El Dorado Hills President Jeff England, left to right. 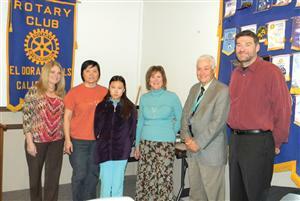 Hannah was honored at the Feb. 8 Rotary Club meeting. Her teacher called her an "exceptional student."